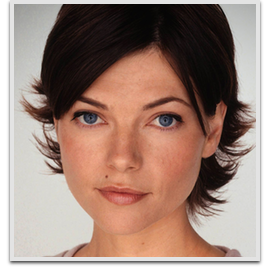 Nicole de Boer’s first major television work was as a regular in the CBC series 9B followed by a recurring role on the Canadian sketch comedy show The Kids in the Hall as Laura, girlfriend of Bobby Terrance (Bruce McCulloch). She subsequently appeared (as a different character) in their 1996 film Brain Candy. Her first major TV role came in 1997, in the short-lived Sci-Fi Channel series Deepwater Black (also known as Mission Genesis) as Yuna. She followed that up with a role in the cult favourite science fiction film, Cube (1997). She was featured in episodes of the Canadian-produced SF series The Outer Limits alongside Robert Patrick (The Quality of Mercy) and Harry Hamlin (Monster). De Boer’s most noted roles have been Ezri Dax on Star Trek: Deep Space Nine (seventh season, 1998–1999), and Sarah Bannerman on The Dead Zone. She was also cast as Dr. Alison Porter in the SciFi channel series Stargate Atlantis, appearing in the fifth season episode “Whispers”.